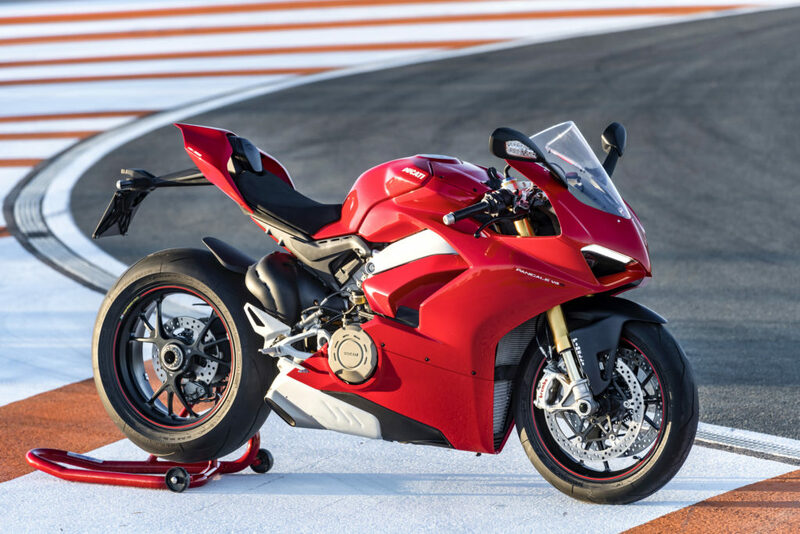 Ducati had to go big with this. They had to make it good. And now, they get to put it to the real test, as the world’s media gives it their critique. They need more than just approval. They need praise. And they chose Valencia to do this, a brave choice, by all accounts. Valencia is a four kilometre long circuit contorted into an arena, and resembles a strand of spaghetti crunch into a table spoon. It folds back on itself in complex loops and long hairpins. It’s a track that will not let any handling misdemeanours go unpunished. 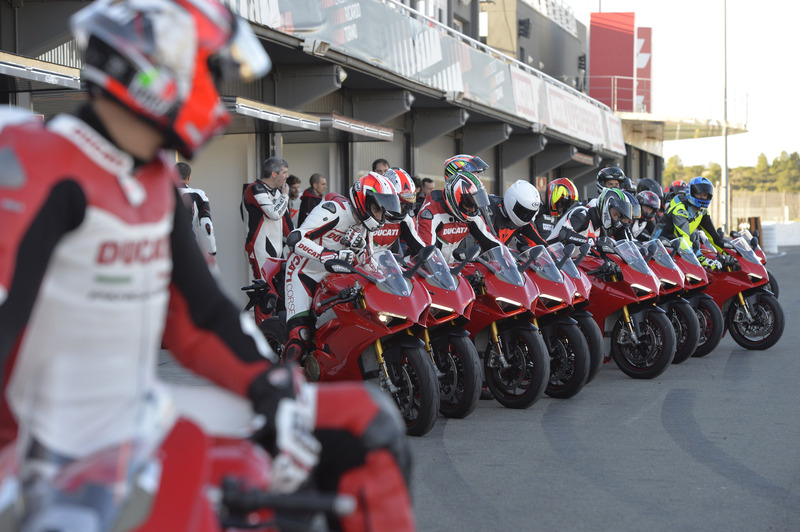 And here in pitlane sat a line of shiny new V4S’s, idling noisily in this chilly Spanish winter morning. 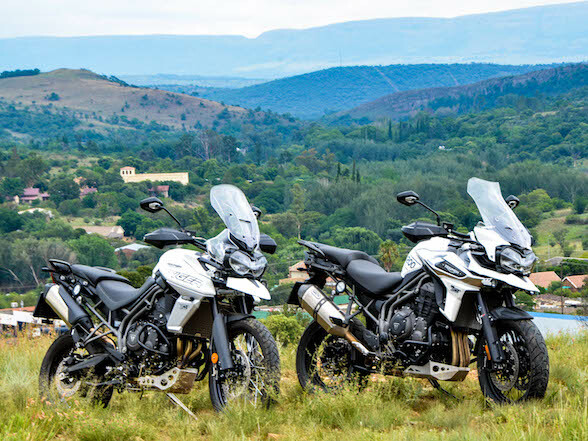 The sound of V-twins is sonorous and joyous, and was presumed to be missed as they are replaced, and yet there is a strange familiarity to the sound of the V4 as it growls gently at idle. 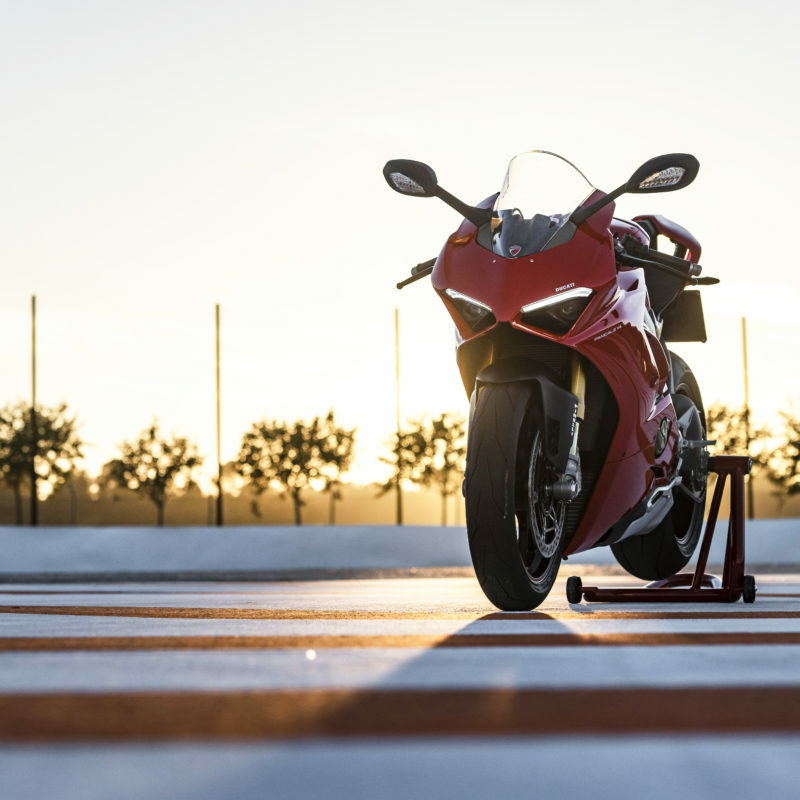 The desmo ring is still there, as you would expect, but the sounds is not like a different motor, but more like someone had manage to sync the idling of two 1299 Panigales in a happy accident. 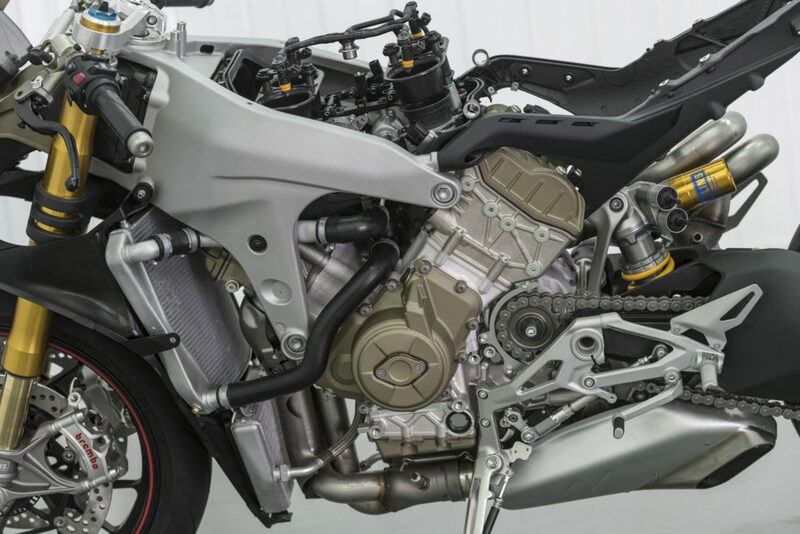 Instead of the V-twin sound disappearing, it has instead doubled up. The time comes to climb aboard, and there’s an instant familiarity about sitting on it, like looking at a small child and seeing his father in him. The looks of the V4 are unmistakably Panigale. 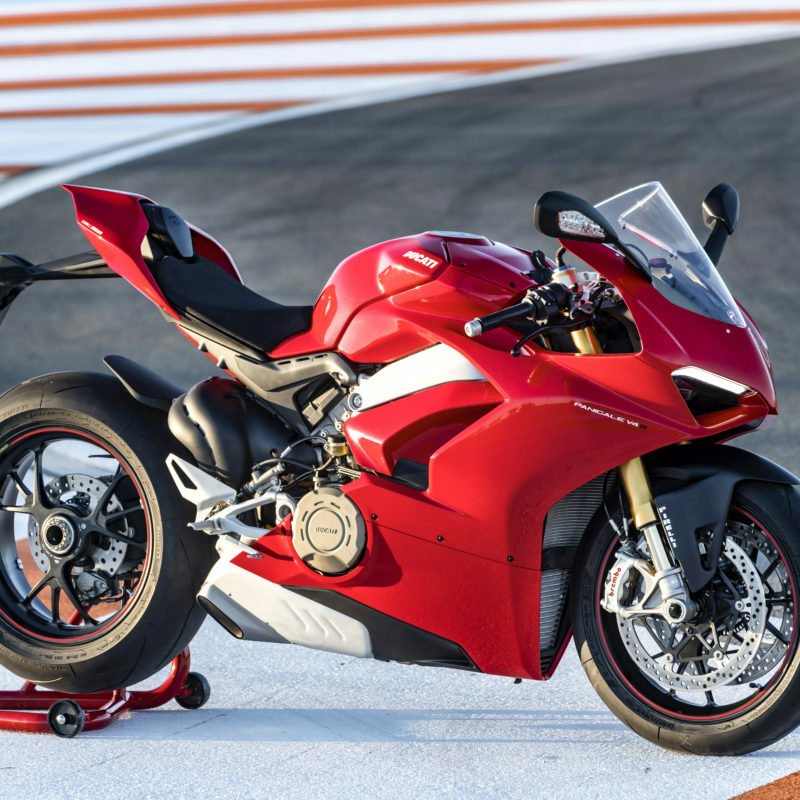 Looking at photos of the V4 from the press package, you could be forgiven for calling the designers lazy, and simply tracing the 1299 design, but seeing it in the flesh shows a bike that is beefier that its 1299 predecessor. Its eyes are angrier, its nostrils are flared and its lats bulge out on its sides. 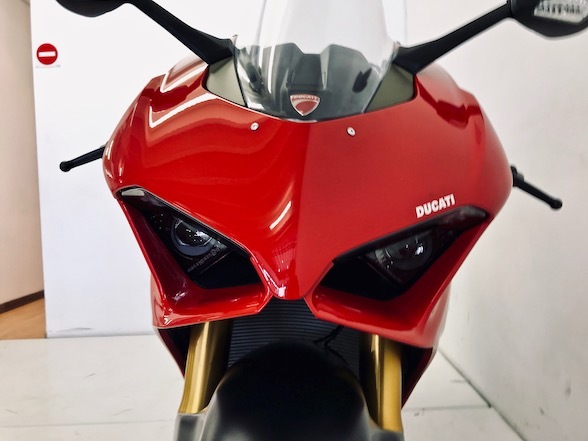 The side fairings have two layers for a better aerodynamic effect, with the outer fairing merging with the tank, so while there is beefiness and masculinity there’s also some grace, a concoction you would expect the Italians to achieve. 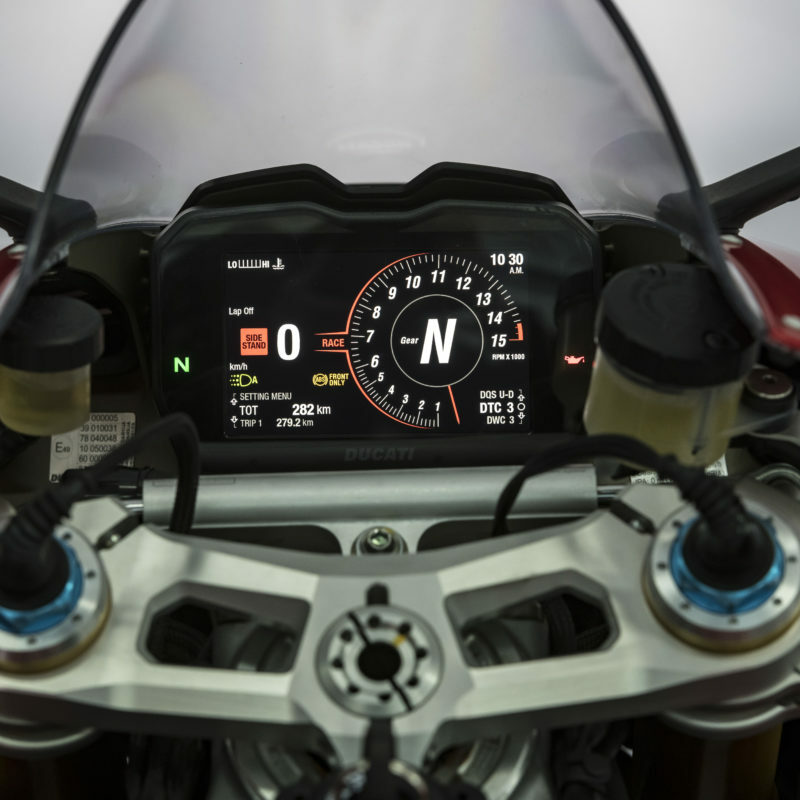 The dash is new also, with a new TFT display and interface that is, of course, beautiful, with everything you need in the right spot. There’s a new switch system on the left handlebar that enables the rider to change any of the vital settings or displays within five seconds. Click first gear, watch the gear indicator switch to from N to 1, and off we go down pitlane with a sonorous growl. Even with the revs a little higher, it still sounds familiar, like the Panigales before it, but with just a mild tone change. 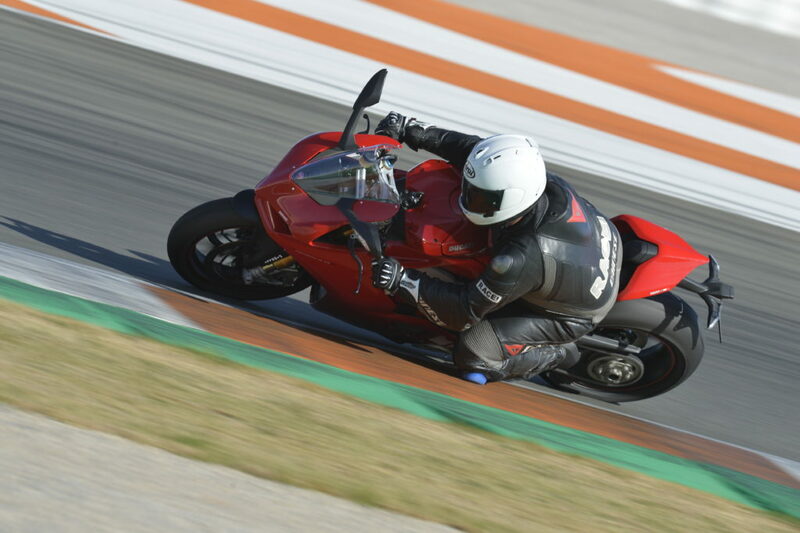 It still sounds unmistakably like a Panigale. 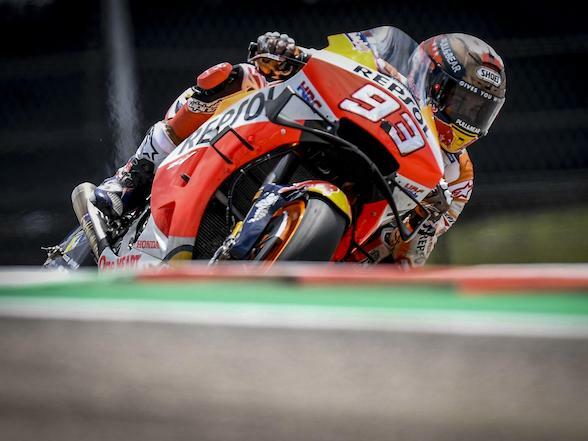 The bike leaves pitlane and immediately we pitch it into turn one, the fast third gear left hander where Marquez nearly saw his plums during the last race of the year. From there, it’s a short straight up to the turn two hairpin that saw Rossi crash out in 2006 and gifting the championship to Nicky Hayden. BRAAP! 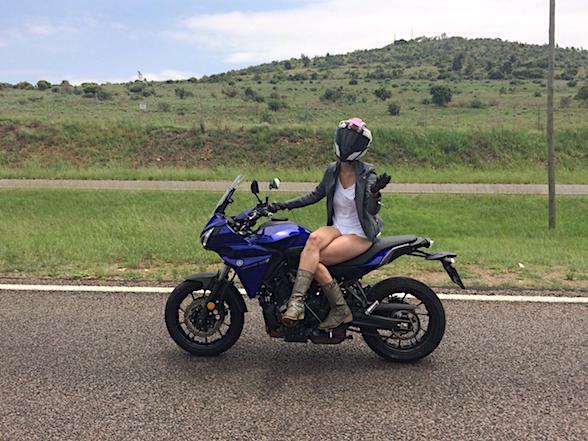 Wheelie! Use the quickshifter to hit third gear. BRAAAP! Wheelie! Brake for the corner, thankfully. 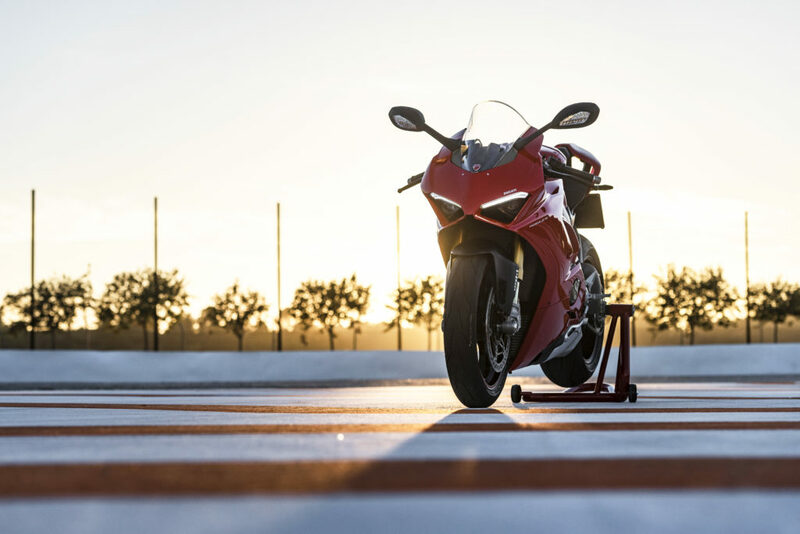 We heard about Ducati’s plan to build a V4-four somewhere around a year ago, but in the skunkworks of the Ducati design department, they have been building on this concept for four year already, meaning they knew they were going that way while we civilians were still gasping at the magnificence of the 1299. 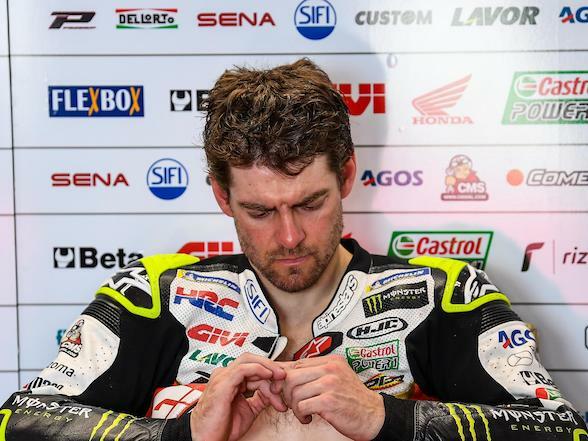 They have been donning their MotoGP machines with V-fours since 2006, and are not short on R&D for the things, plus they can continue basing their road machines on their race bikes and, who knows, maybe even beat that pesky Johnny Rea in World Superbikes. While twins traditionally create better drive out of corners, fours are better at top speed and punching out of hairpins. Although the line has been blurred slightly thanks to electronics and irregular firing orders. 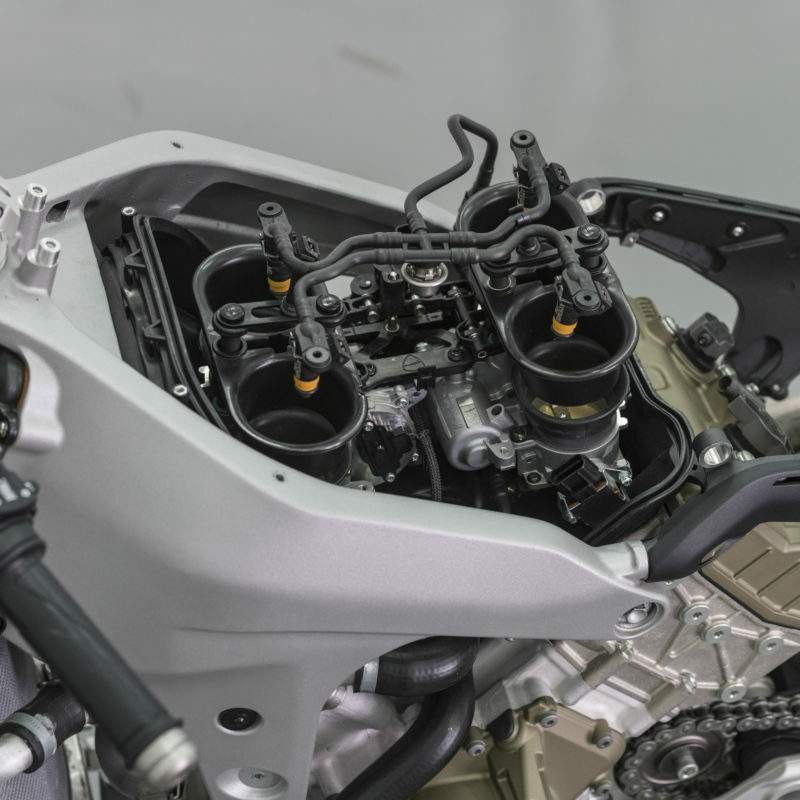 The V4 counter-rotating crank adopts a concept much like the Crossplane crank on the R1, where by two cylinders fire in quick succession, followed by a long pause before the other two cylinders repeat the process. 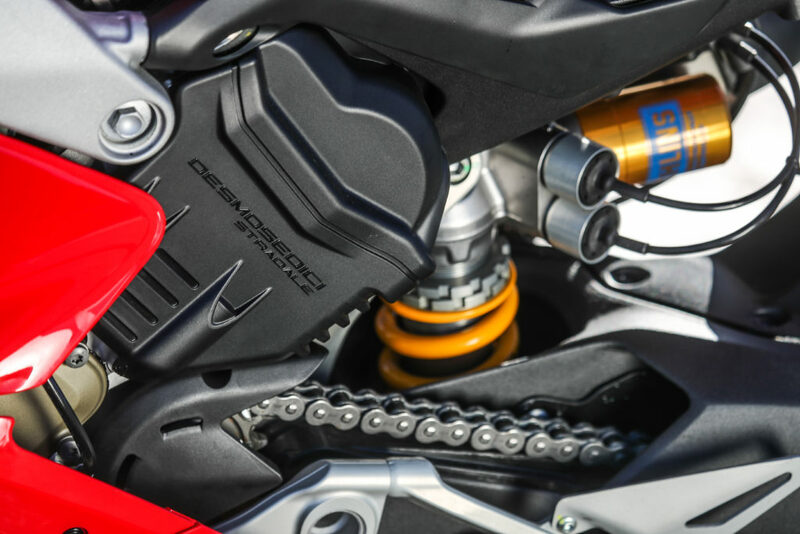 This offers better control through the corners due to less inertia torque from the crank, allowing the bike to hold a line better while the throttle is open. The nature of the power delivery means it has easy torque at most revs, tons of traction and doesn’t drive wide. This did not go unnoticed on the track. While the horsepower of this machine is savage, it is still able to pick up speed while leant over without lifting the front and pushing it to the outside of the corner. 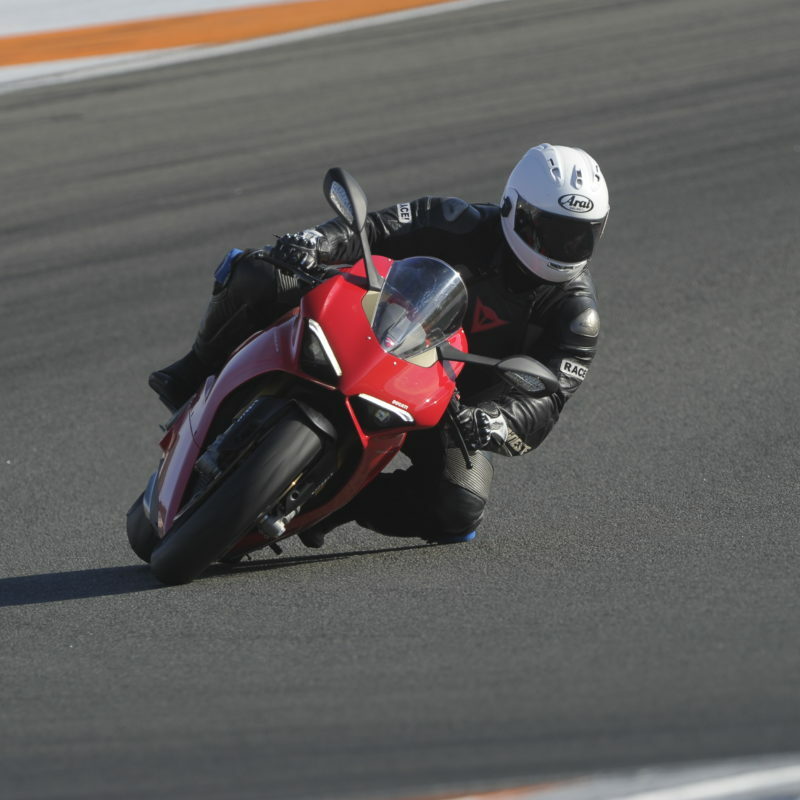 This means the bike can carry more entry speed and still be capable of grabbing some good drive out of the corners. mass centralisation and more precise weight distribution. 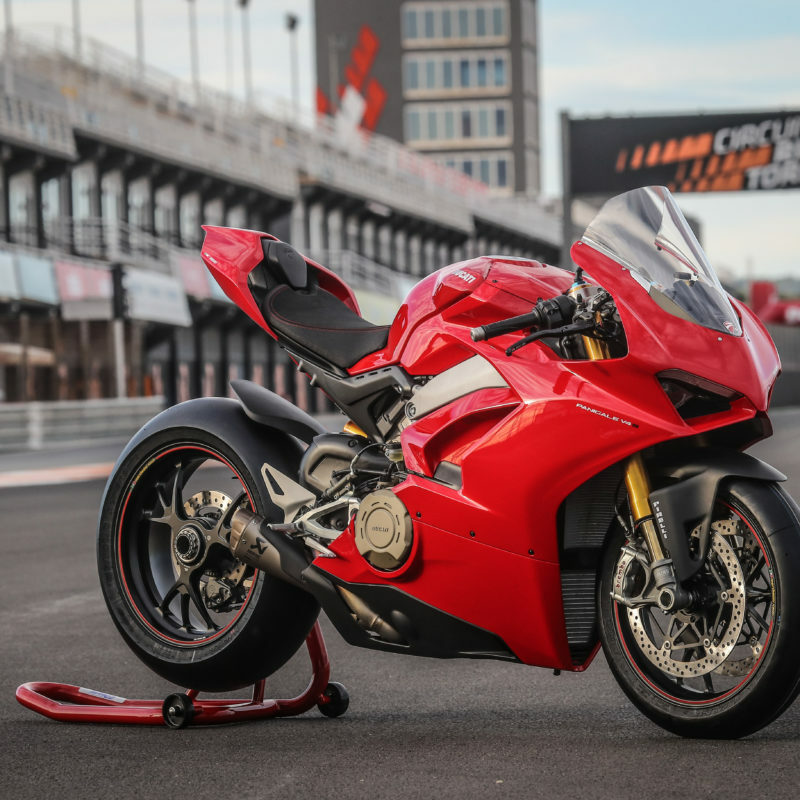 Also, the V-four weighs in at 64.9 kg, that’s 2.2 kg less than the 1299. The 90º V-four motor tilted forward by 42º. Obviously, there is the power. Four cylinders make more of it, and in this case it churns out an astonishing 214 hp. 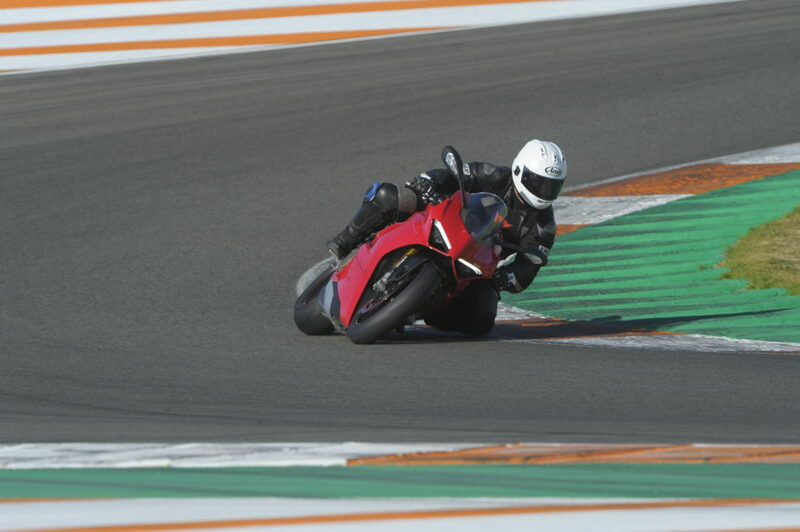 With a kerb weight of 195 kg (for the S models that we were riding), it produces a power to weight ratio on 1.10:1. 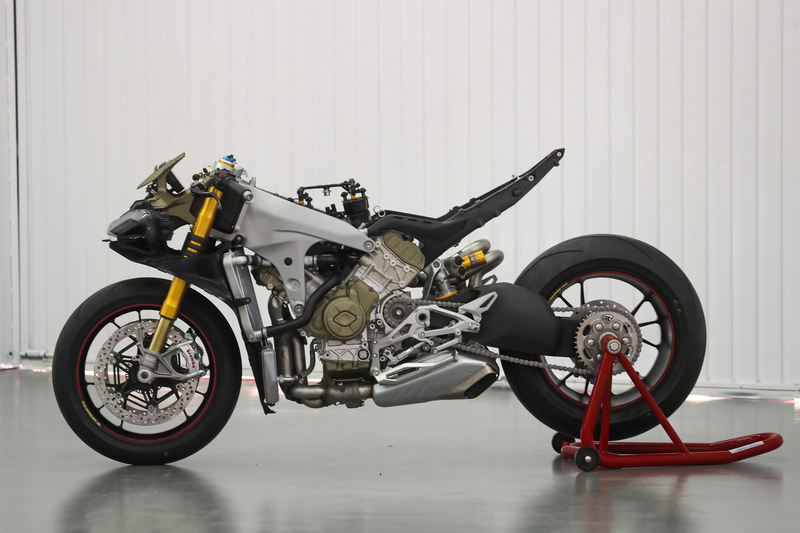 Think about that – in a world that recently celebrated production superbikes that at last achieve power to weight of 1:1, here we have a motorcycle available to the public that produces 10% more power than it weighs. And you can feel it. 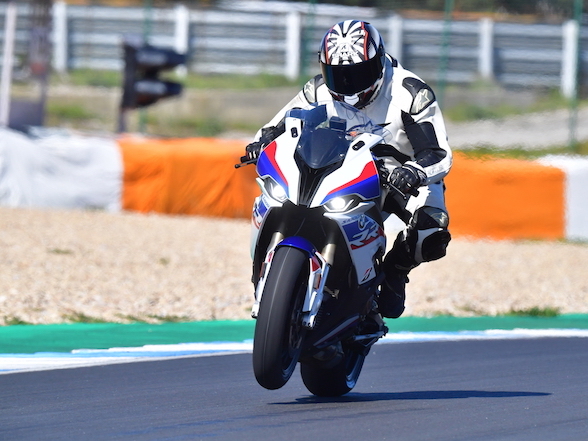 In fact, we now understand what all the fuss is about wheelie control in MotoGP. 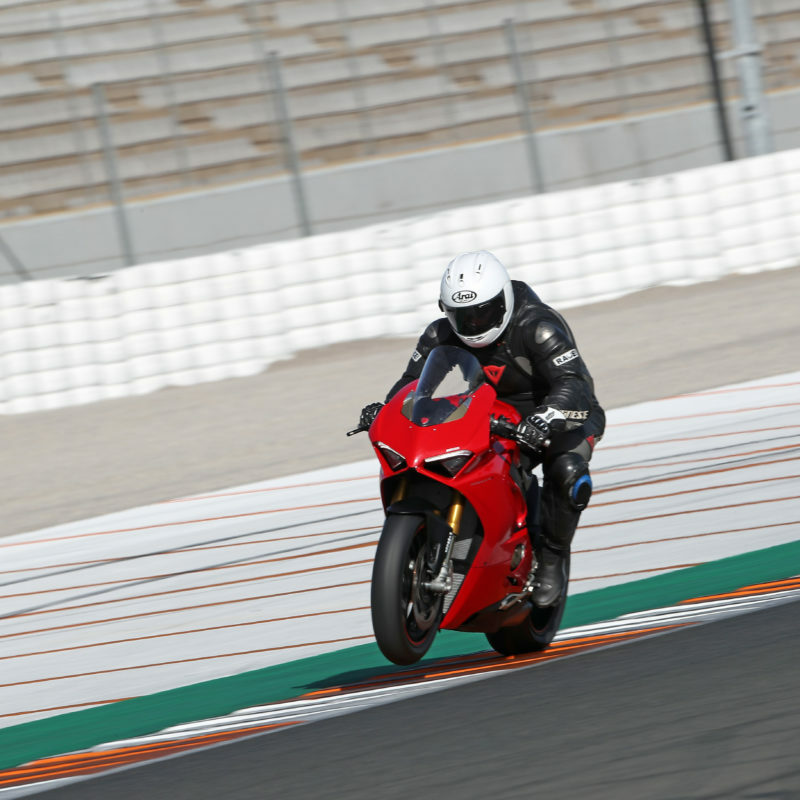 Out of Valencia’s sharp last, left-hand corner, you exit in second gear, get the bike pointed in the right direction and stood up as soon as possible, and then open the throttle. 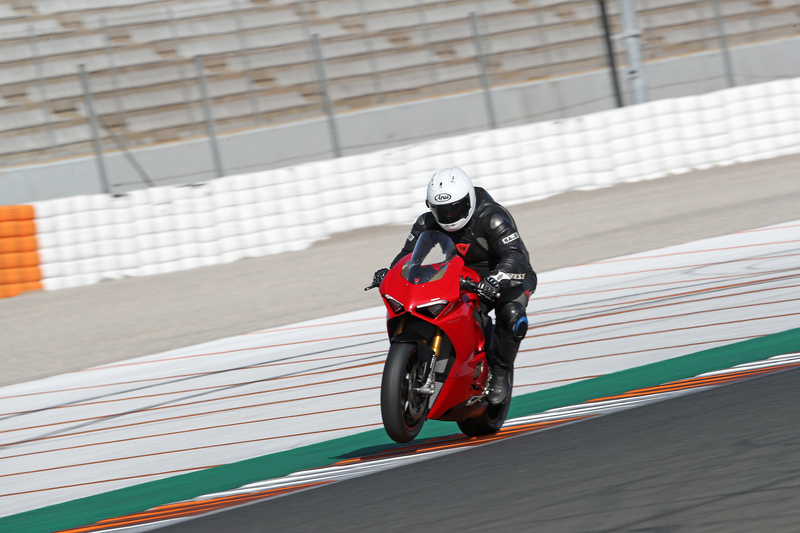 The front wheel predictably lifts, but the clever wheelie control holds in about a foot off the ground. You quickshift to third at the 14,500 rpm rev limiter and again the front simply hovers in the air as you hold on for dear life. 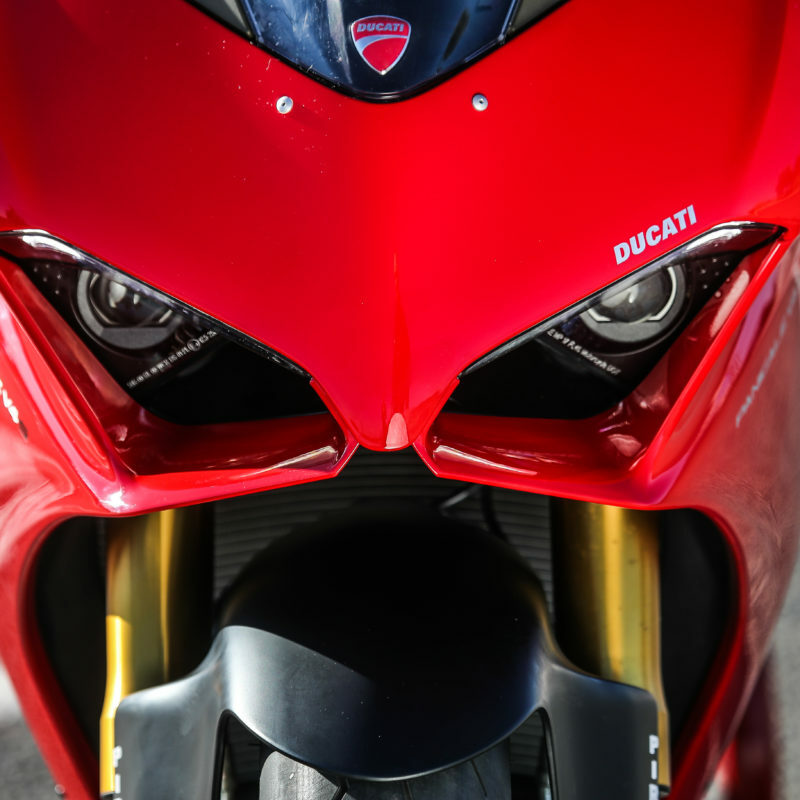 The sound of the engine has now transcended the Panigale ringtone and has spawned a whole new cacophony of banshee, deranged bear, rabid tiger and velociraptor. It’s a spine chilling combo. 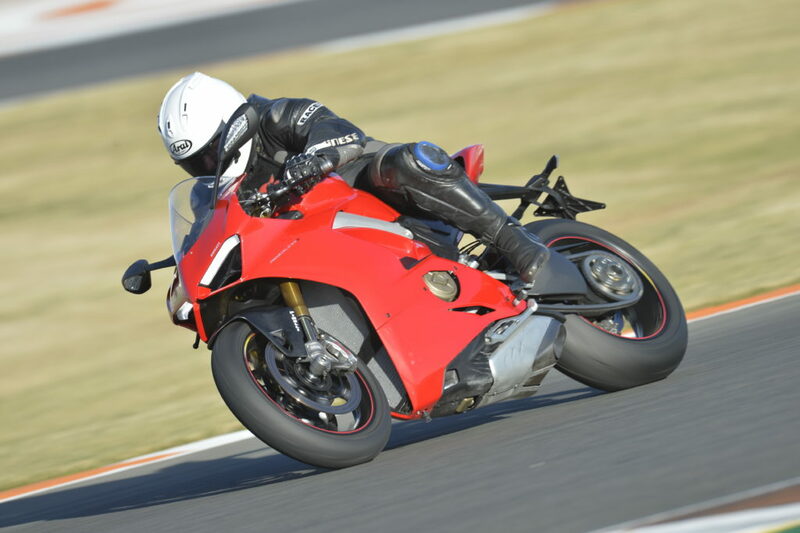 At this point, as third gear gets its groove on, other superbikes will start losing the fight against gravity and the front wheels flight comes to a gentle end. With the V4, the wheel touches earth briefly as it clicks over to fourth gear, before muscling up all of its energy pulling one last lift. At this point the bike is doing close to 250 km/h and the yellow light representing the wheelie control is still flickering. 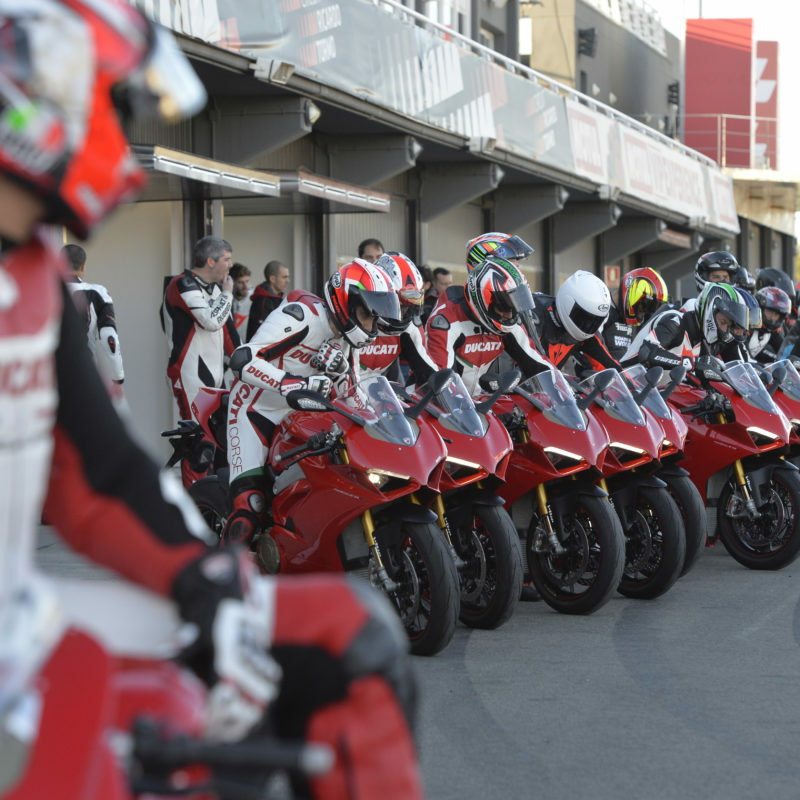 Imagine how the MotoGP boys battle. 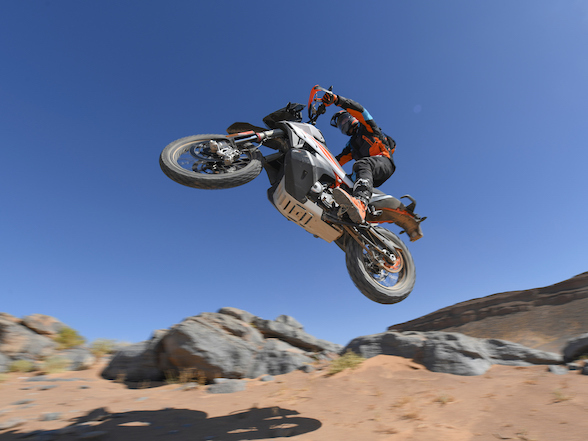 The power isn’t restricted to top end. No, not at all – it is amazingly spread throughout the rev range, and often corners that would normally be attempted only in second second now have the option of going to third. Often, the power is more useable a gear higher, while still having more than enough grunt to pull out of the corner. 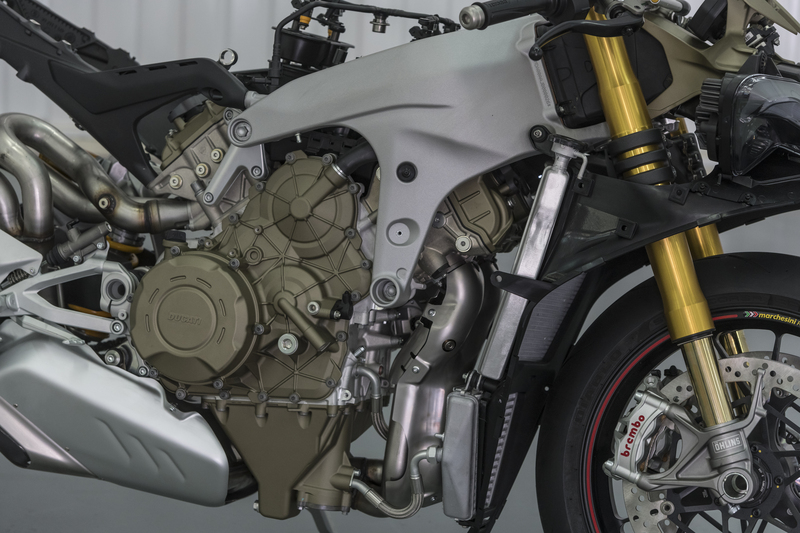 This is partially down to an increased capacity of 1,103cc, that is out of WSBK regulations, although Ducati is going to be releasing a 1000cc V4 R version for racing homologation purposes later this year. 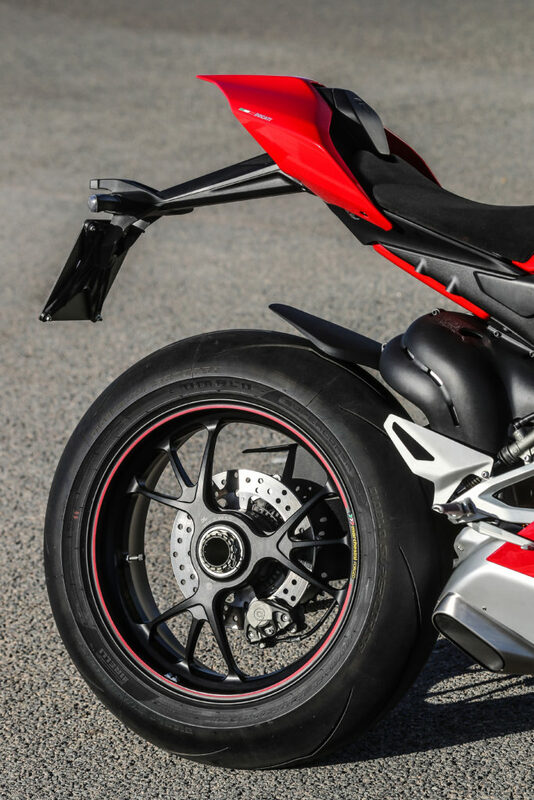 The extra cubic centimetres are there not so they could achieve maximum power, but rather to help boost the bottom and midrange. 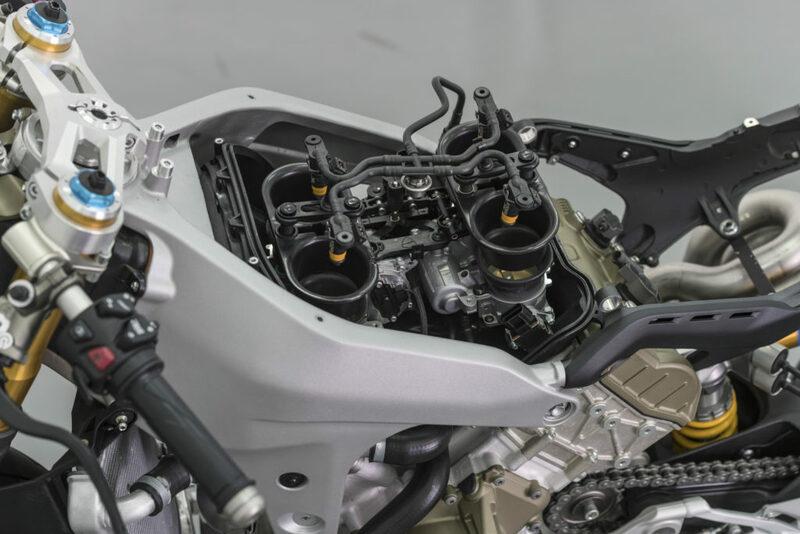 There are also variable intake ducts in the airbox, a first for Ducati, that further help spread the power delivery. 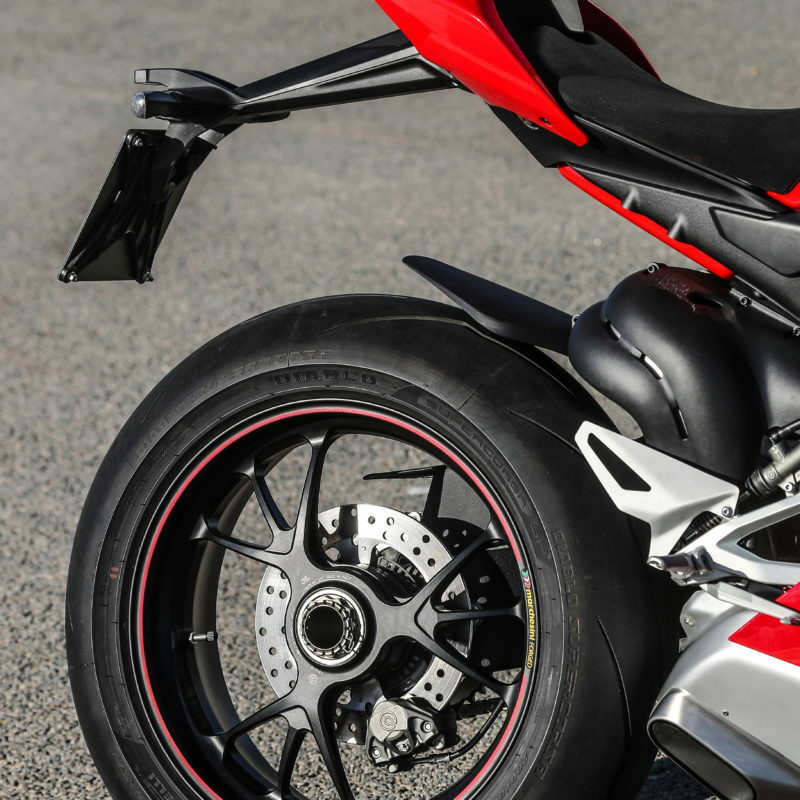 The new variable airducts in the airbox offer a broader range of power. 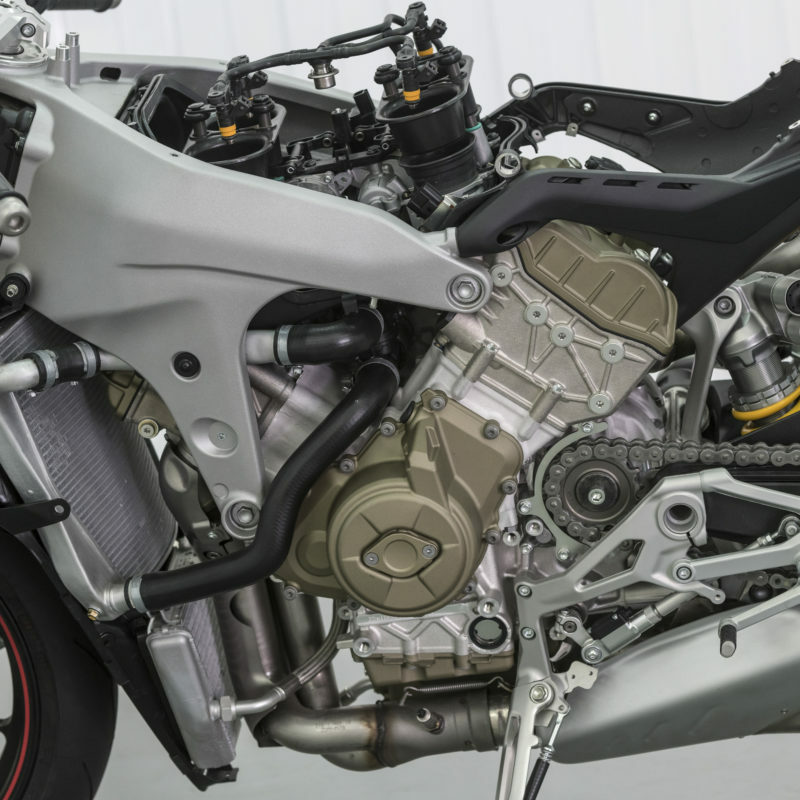 Anyone who is a Marvel geek with tell you that power is nothing without control, and Ducati has completely redesigned the frameless chassis, keeping the engine as a major contributor towards the bike’s physical integrity, but has now reworked the front subframe for better torsional and longitudinal rigidity. 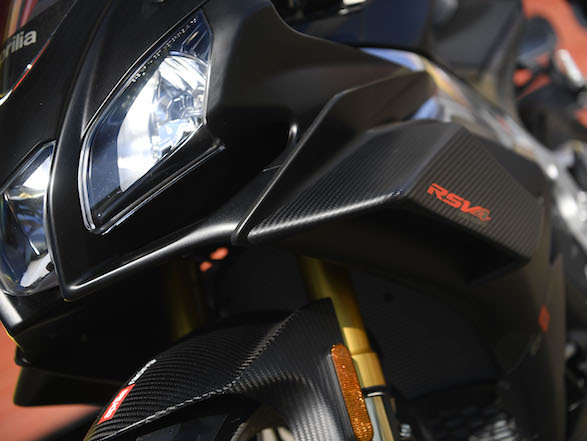 With the smaller engine comes space for a longer swingarm, and this aluminium unit is 67mm longer while keeping its weight the same as its predecessor. 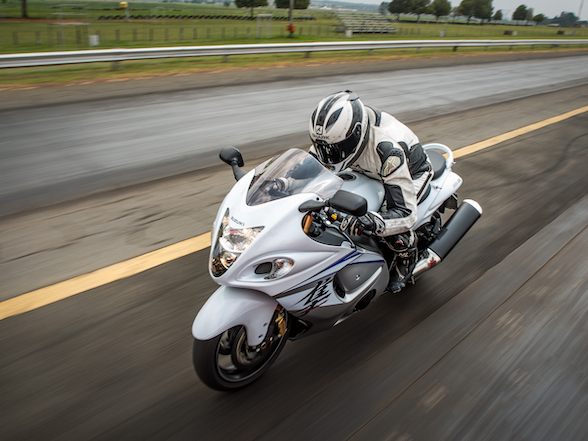 The extra length means more traction out of corners without sacrificing agility. With all this, the wheelbase has been extended, which makes sense given the need for more stability under the load of the extra power. 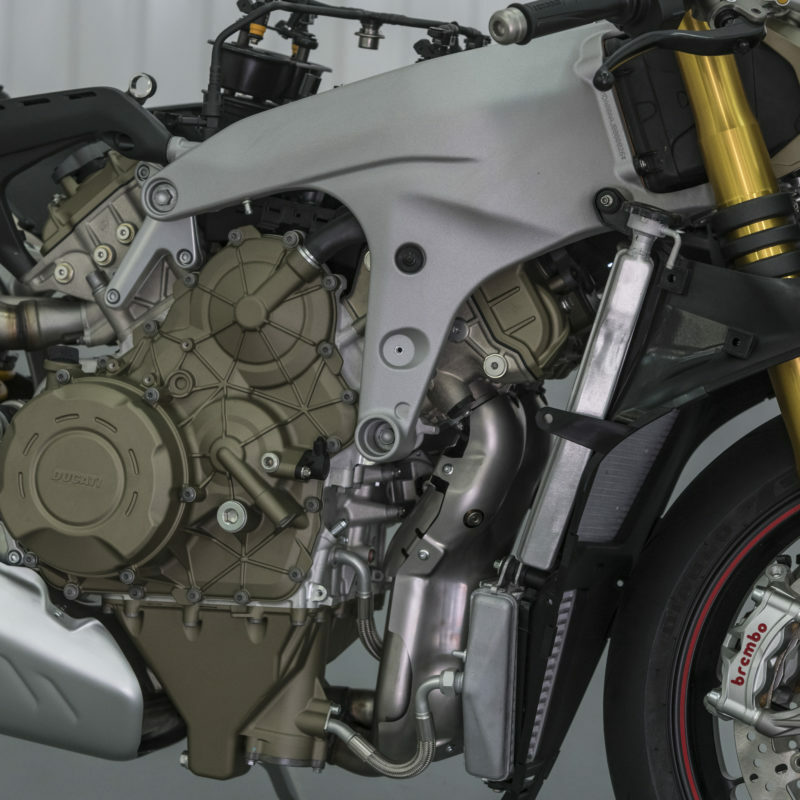 Helping keep the weight down is a Lithium battery, plus an aluminium fuel tank is new and inspired by that of the MotoGP machine that descends under the seat for a more balanced weight distribution. Not that they’ve kept the weight distribution balanced, mind you. 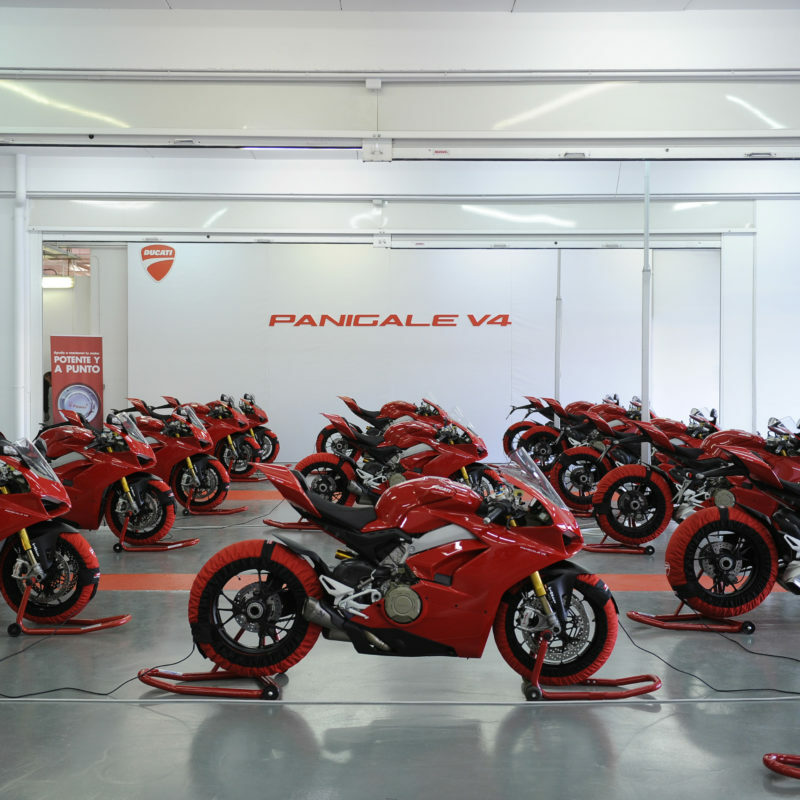 The 1098/1198 models boasted a perfect 50/50 distribution, while now the V4 shows a 54.5/45.4 biased to the front. 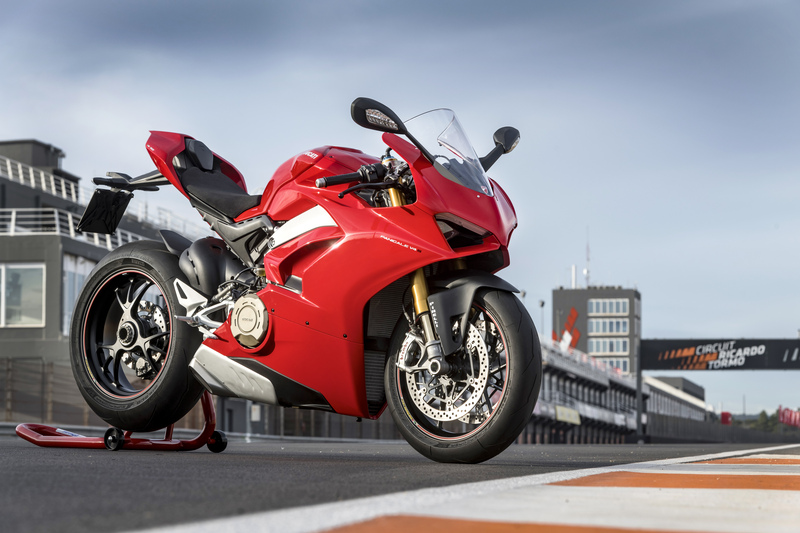 Technically, If you want to be thoroughly analytical about things, the V4 is slightly longer and slightly heavier than the 1299, meaning it should be more stable but also more sluggish when holding a line through corners. 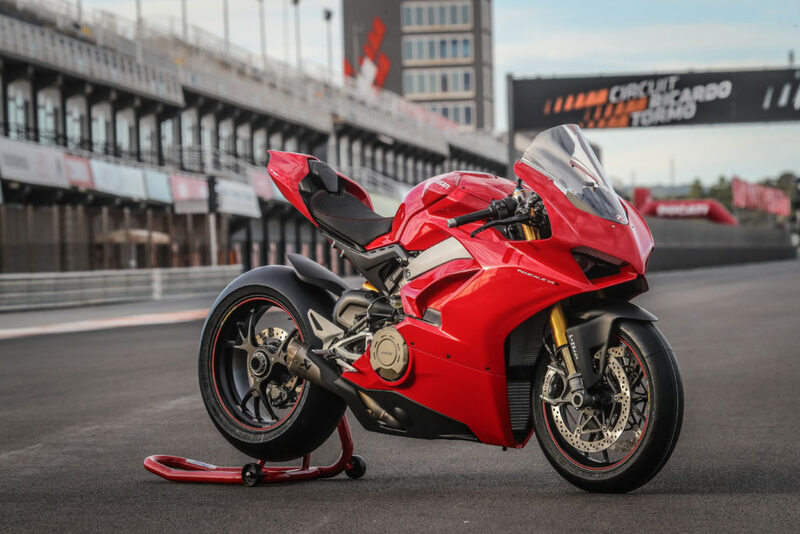 Thankfully, there’s more that contributes towards the dynamics of a motorcycle than just wheelbase and overall weight especially, in this case, weight distribution and mass centralisation, both of which point to more agile handing and a confident front end feel. 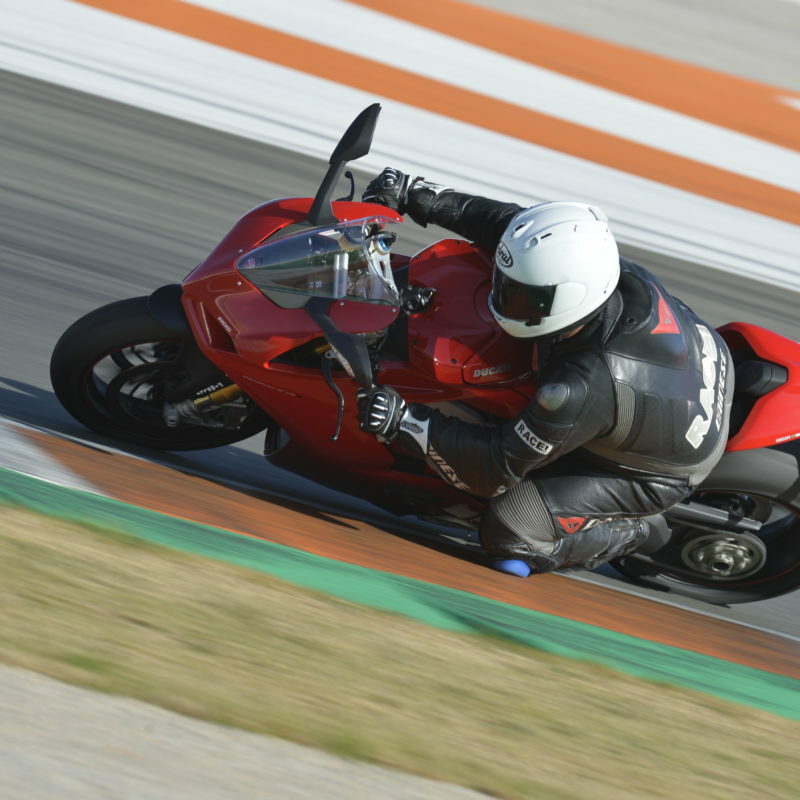 Mass centralisation and forward weight distribution means agile handling. 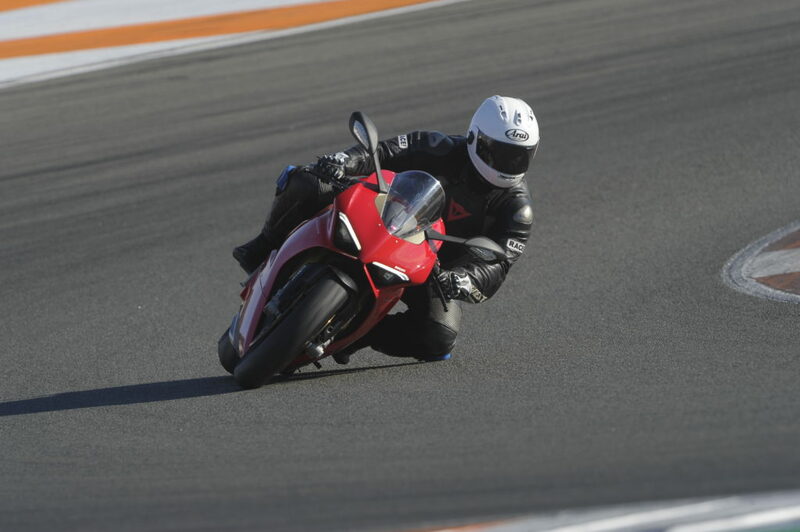 Valencia is a tricky circuit, in case we haven’t made that absolutely clear yet. The trickiest part is the way the tight hairpins seem to go on for slightly longer than you expect them to. 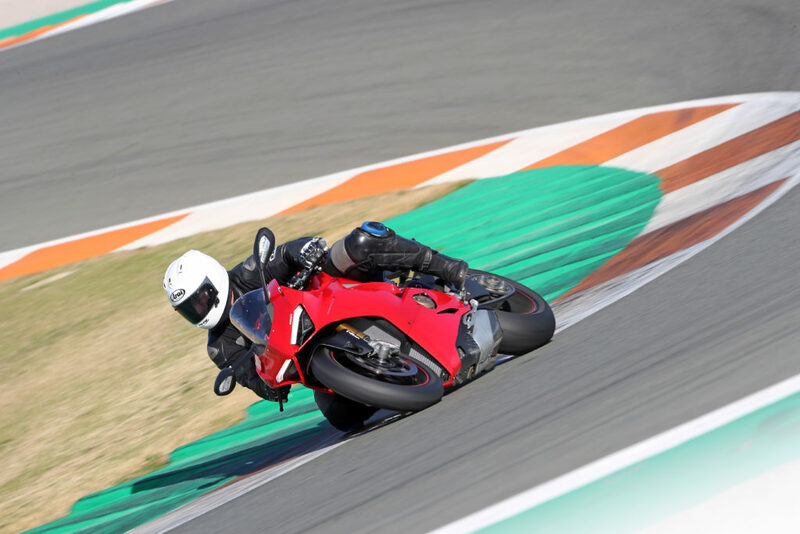 You turn into the corner, taking a wide entry and giving yourself plenty of room, you apex and then begin rolling on the throttle to prepare for the exit, the exit that doesn’t seem to come, and you end up in the middle of the track at full lean with the throttle a quarter open. 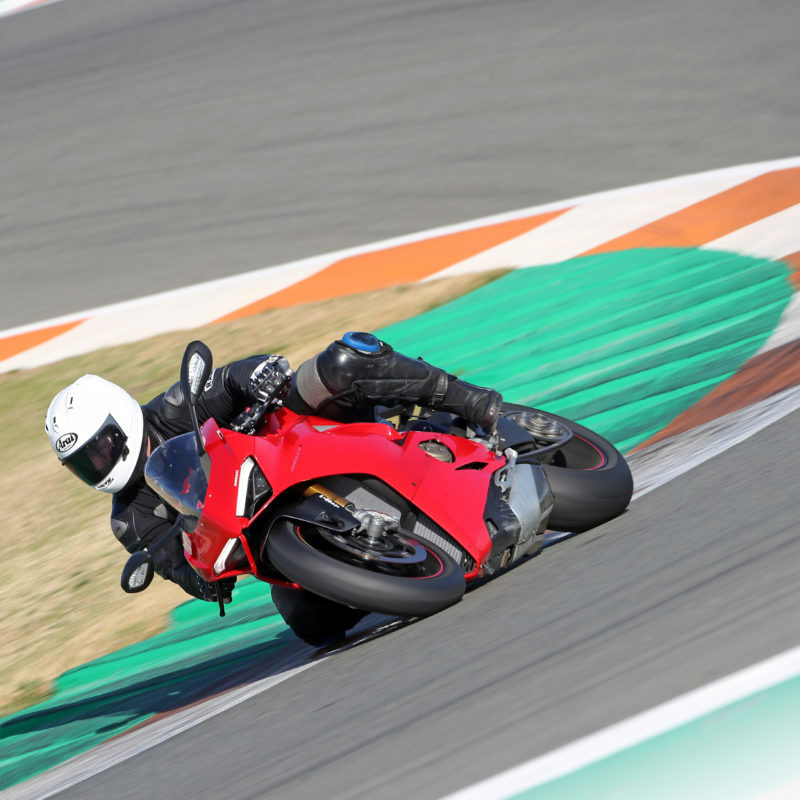 Most of this is down the rider’s knowledge of the corners (that is not great given that we are from abroad), but also the bike, that tend to fight you as you try and keep all the load on the skinny front and comparatively wobbly front forks. 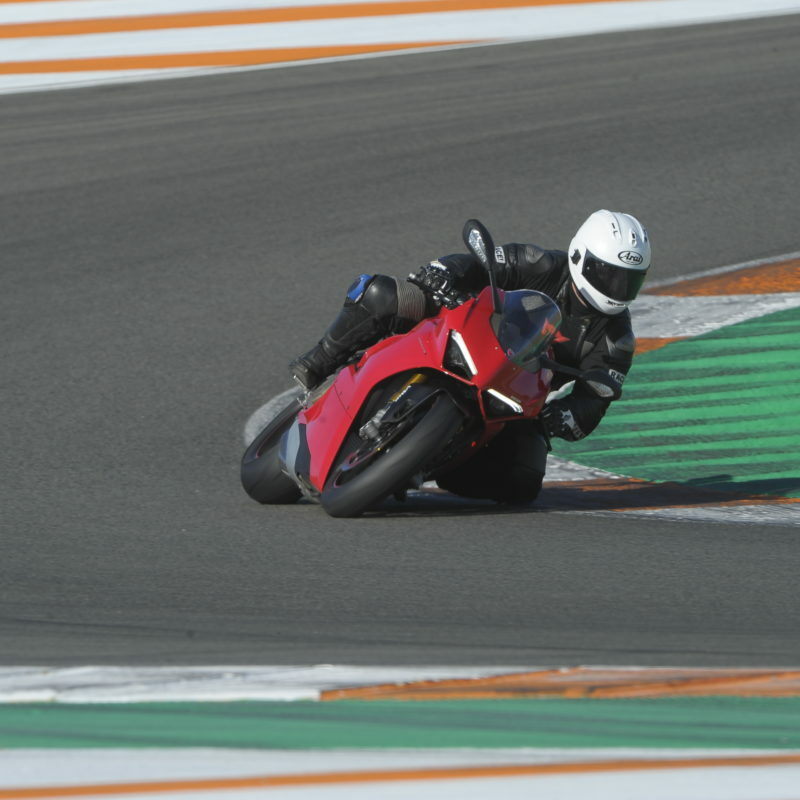 This is why we said that Ducati were brave to launch a 214hp beast here, a circuit that favours more agile and gentle machines and yet, here the V4 thrived. 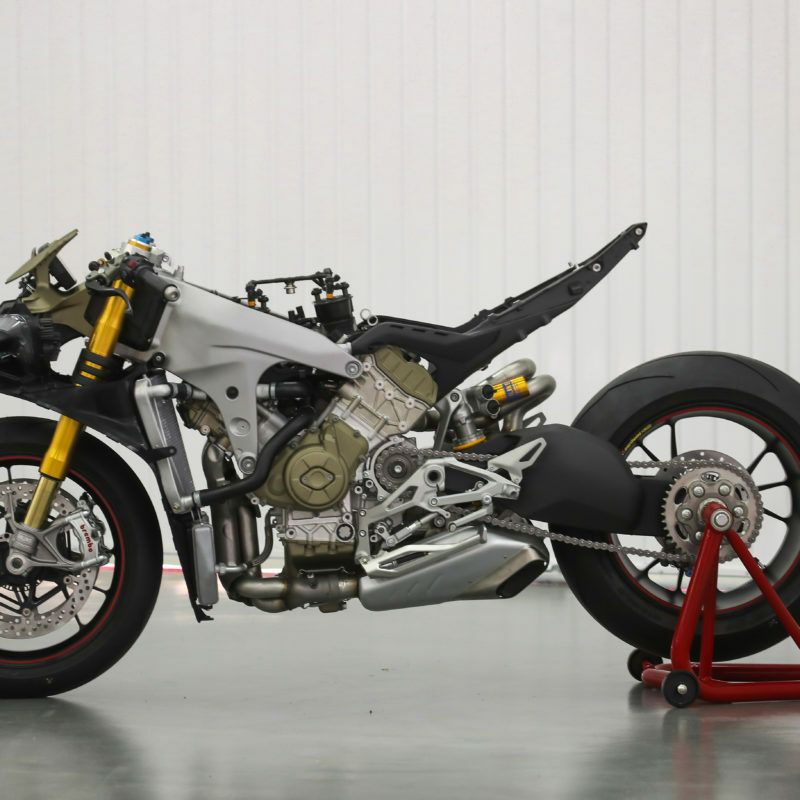 The engineers have worked sorcery with that chassis. 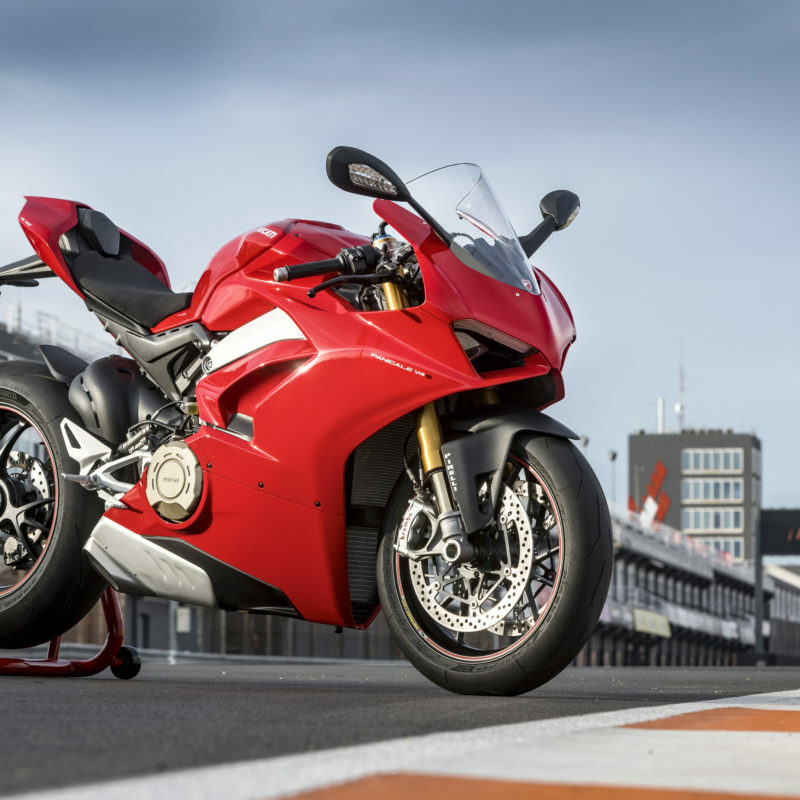 It tips into corners with the same agility as the previous 1299, and then it sticks to the line like Japanese high speed train. 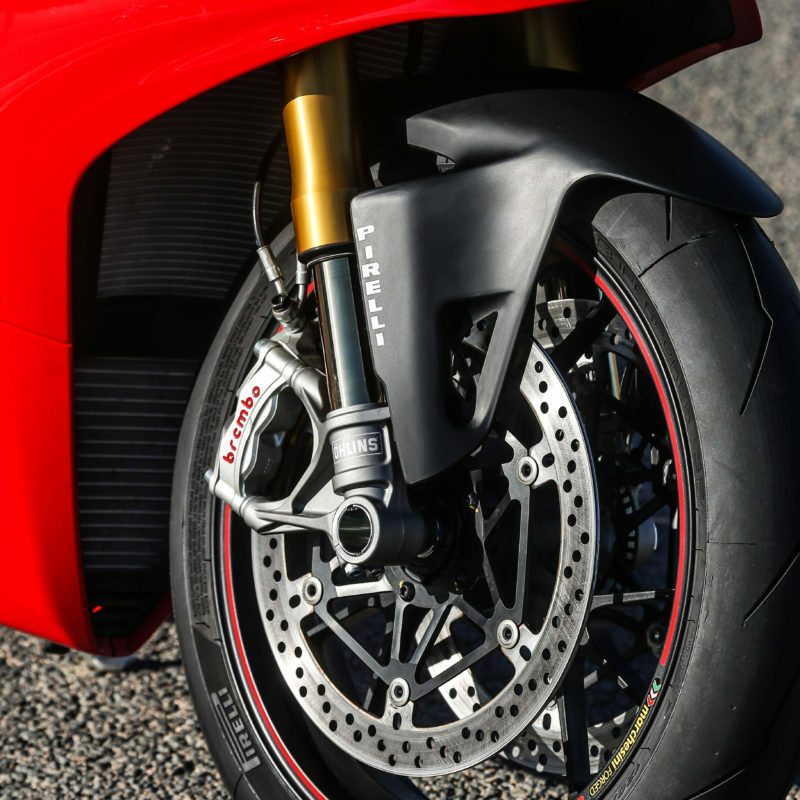 What’s truly amazing is how easily it is able to clip the apex, with the wheels having no problem running over that little strip of paint that marks the transition from tar to rumble strip, just like a MotoGP bike. 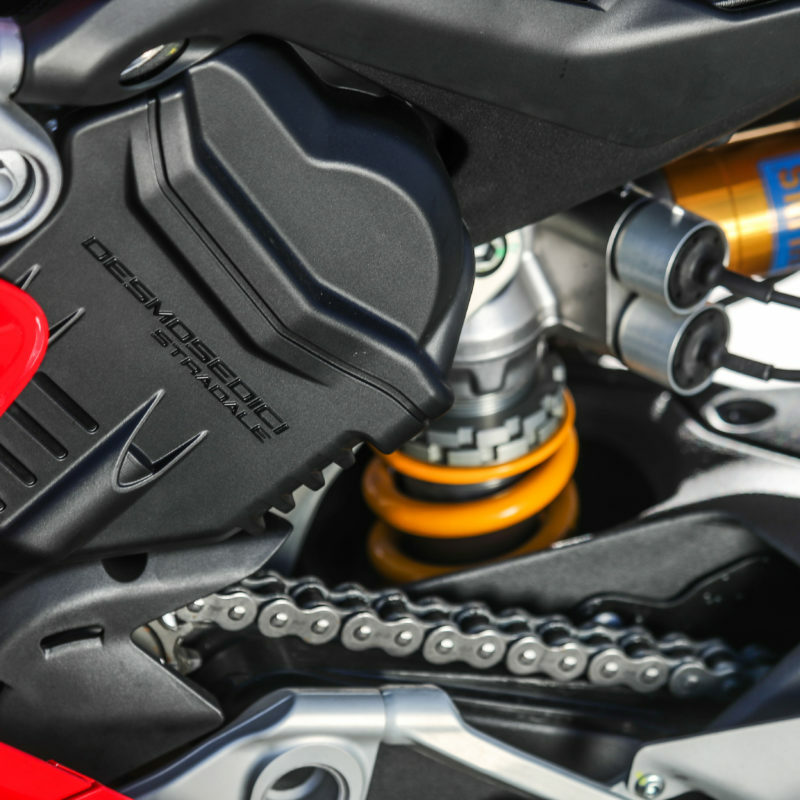 The Ohlins adaptive suspension works well, and we know this because there we no massive setup complaints, and at no stage could we feel it actual working. It just got with things in the back ground. Clipping the apex with ease. 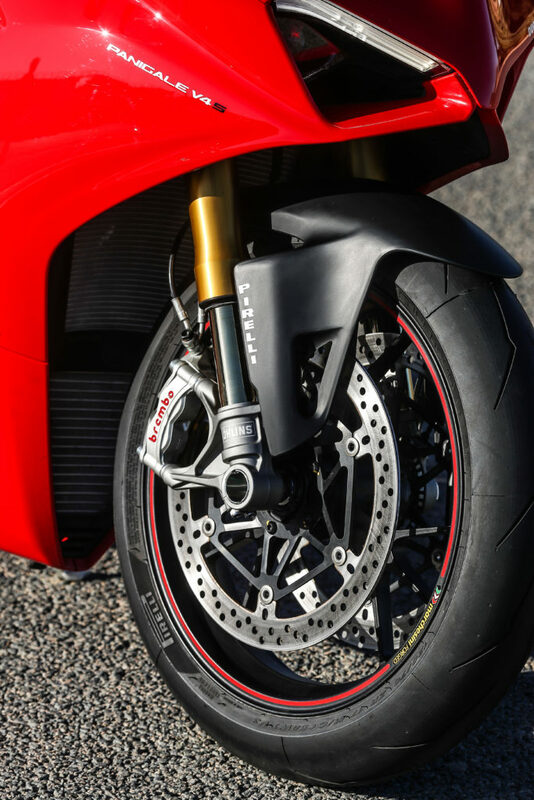 There are two new products that are being debuted on the V4 – Brembo’s new Stylema callipers that have a better cooling system and offer not only better braking, but even better consistency than their M50 predecessors, and Pirelli’s new Supercorsa SP model that feature a new 200/60 profile, thinner grooves, a different tread design, a new geometry and new slick shoulder. 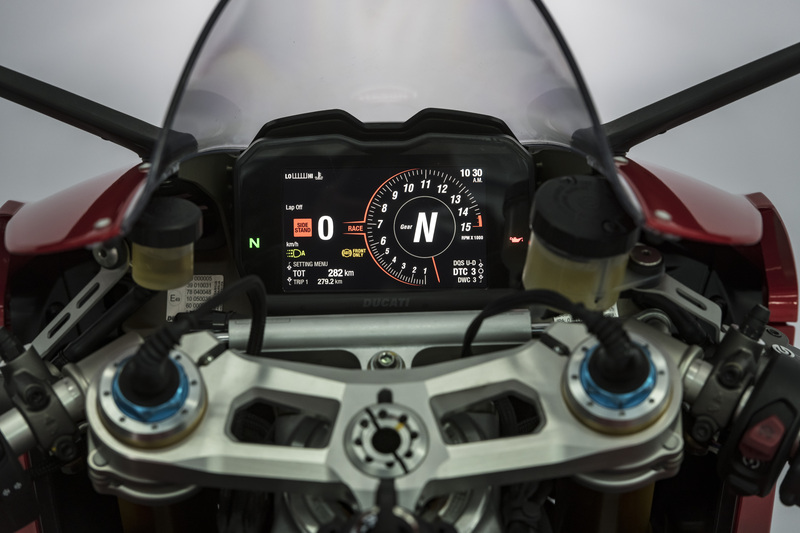 The electronics feature everything the previous Ducatis had – traction control, slide control, both-ways quickshifter, engine brake control, riding modes and a launch control, except that they have all been completely redefined using the latest generation of Bosch electronics, and now work more seamlessly with more precision.The big new addition is the Bosch cornering ABS that has a function on the rear ABS that is much like the slide control function, but instead of allowing controlled slides out of corners, it allows it to have controlled drift into the corner using the rear brakes. In full race mode, the rear ABS is turned off completely, leaving you to your own talents, but in level two it will actually help you back it in. 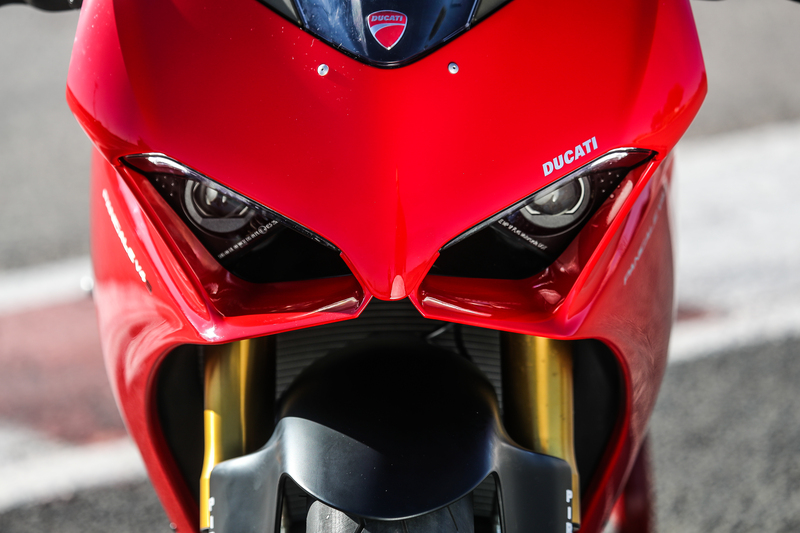 This is incredible technology, and us everyday mere mortals get closer to riding gods. There are critics and skeptics coming from every angle, and they are all going to be left thoroughly disappointed. 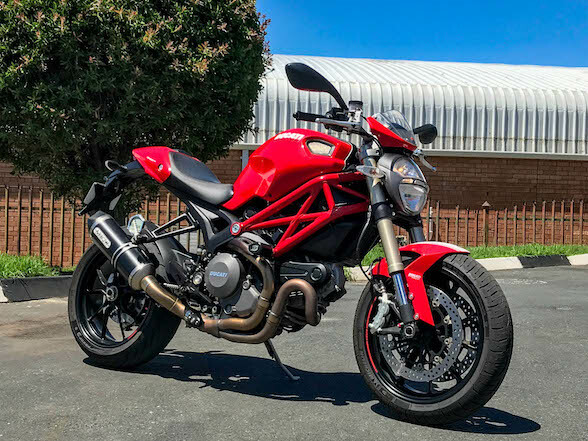 The stereotype that Ducati can only build twins has been broken – this V4 is truly magnificent, a game changer, a new benchmark. 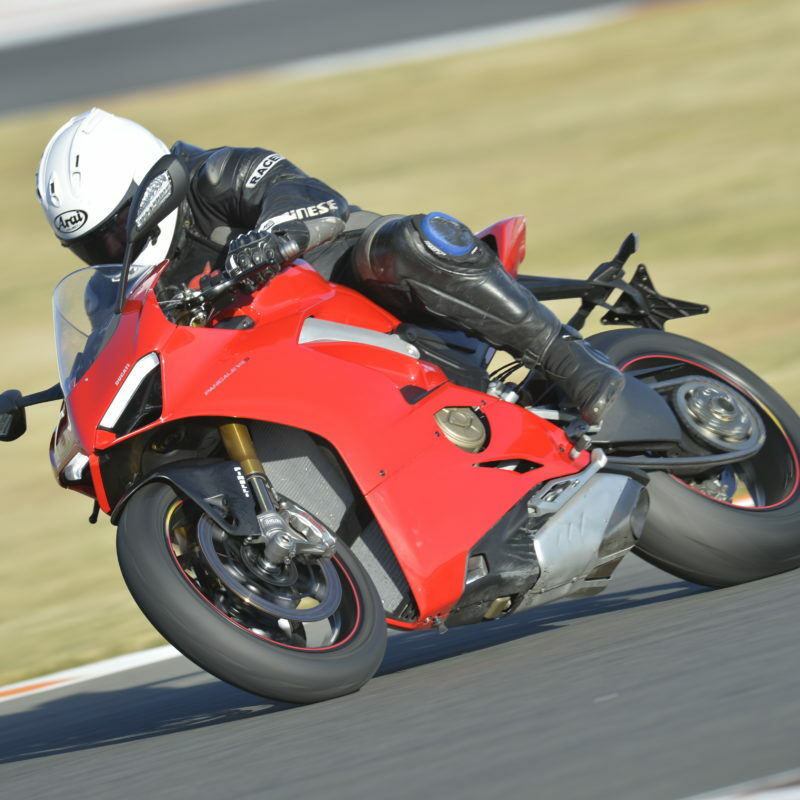 Put it this way – I have ridden a good few race bikes, World Superbikes and exotic specials in my life, and it would be massive compliment to any of these machines if I described any of them as nearly as good as the standard Panigale V4 S. It’s that good. 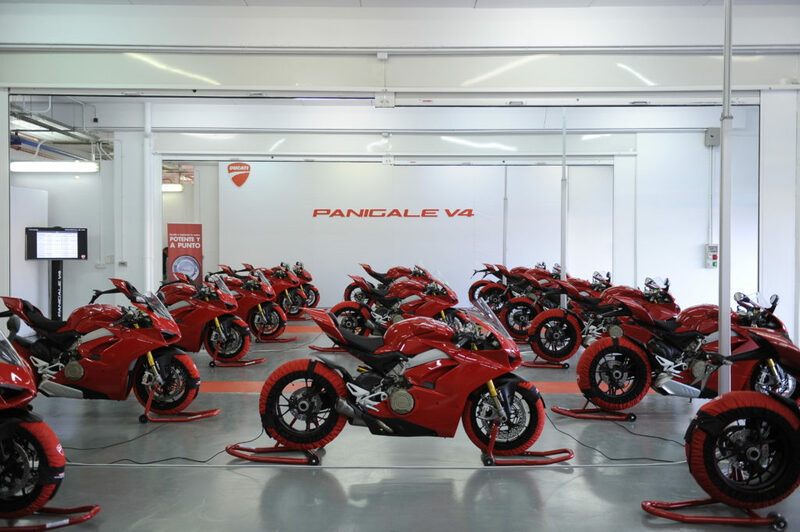 The Ducati Panigale V4 S will be landing in South Africa in February and the base model will be landing in March, however both of these shipments have already sold out. The next shipment for both will be in April, but those are selling out pretty quickly too. Mass centralisation and had forward weight distribution means agile handling.